The hunt for a killer draws a detective into an even larger mystery: the nature of the universe itself. Mike Hoolihan is an unconventional New Orleans cop investigating the murder of renowned astrophysicist Jennifer Rockwell, a black hole expert found shot to death in her observatory. 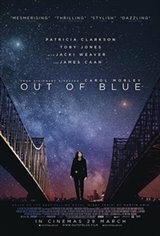 As Mike tumbles down the rabbit hole of the disturbing, labyrinthine case, she finds herself grappling with increasingly existential questions of quantum mechanics, parallel universes, and exploding stars - cosmic secrets that may hold the key to unraveling the crime, while throwing into doubt her very understanding of reality. Awash in dreamlike, neo-noir atmosphere, this one-of-a-kind thriller is both a tantalizing whodunnit and a rich, metaphysical mind-bender.